In the early hours of Sunday morning, under the light of a bright moon and with an invincible interior strength, women and their partners, the caregivers and dreamers of the Cuerpos Gramaticales collective woke up to carry out a special commemoration: after a year of preparation the day had arrived for the Cuerpos Gramaticales performance-action. 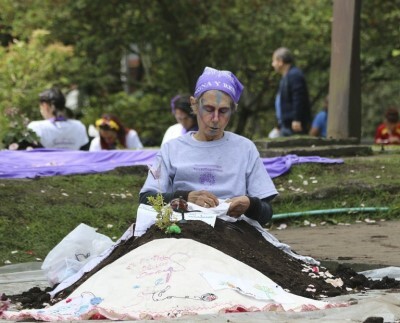 This is the fifth year that dozens of extraordinary people have decided to plant themselves in the earth to claim their rights, “to speak to the country about the life and death stories hidden behind the cold figures from the Colombian armed conflict”, to carry out a cathartic act, using connection with the earth to express their will to heal, to be reconciled, and to say in a single voice that they have had enough of so much violence. 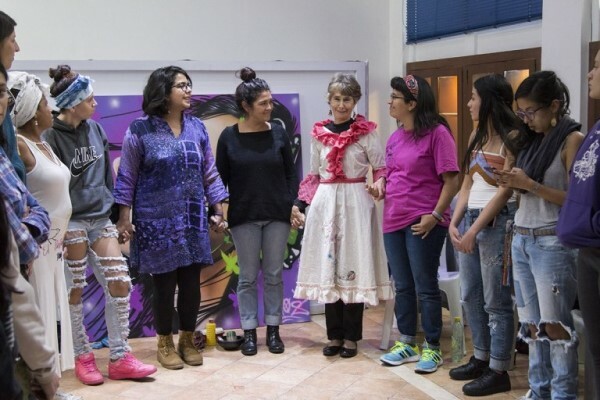 This year the performance-action took place on November 25, the International Day for the Elimination of Violence against Women. 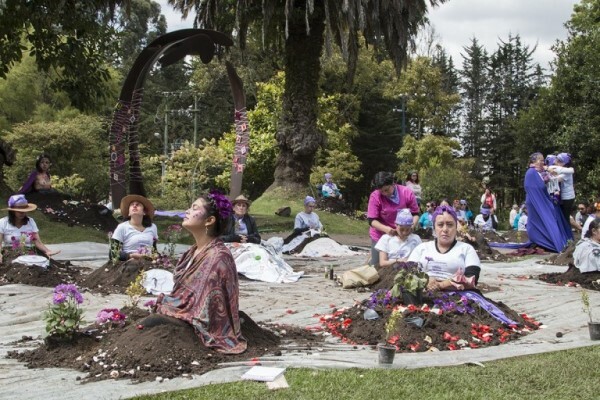 The aim was that “the planting of bodies will bring together the voices and feelings of women throughout the country, who have been violated for decades. It was a collective catharsis process, as the women wanted to recognize, reconstruct, and heal the silent history of abuse and violence inflicted on their bodies, which has contributed to social and gender inequality.” The action expressed the rejection of so many femicides, so much violence against women’s physical and emotional bodies, both within and outside of the armed conflict, with more than 50 women planted for 6 hours in the National Park in Bogotá. The choice of location was not accidental; this was the place where Rosa Elvira Cely was raped, tortured, and murdered on May 24, 2012. This atrocious crime that shook the country opened up a debate on violence against women and led to the recognition of femicide in the criminal code: “Rosa Elvira exposed the multiple forms of violence against women, and the lack of legislative response. After the case was made public, voices were raised in favor of legislative reform; there were calls for the death penalty, for life imprisonment. What we did was listen to the demands of these citizens, who wanted effective action,” said Isabel Agatón, one of the people who promoted the Femicide Law, also known as the Rosa Elvira Cely law, which allows certain kinds of murders of women to be recognized as gender-based violence. 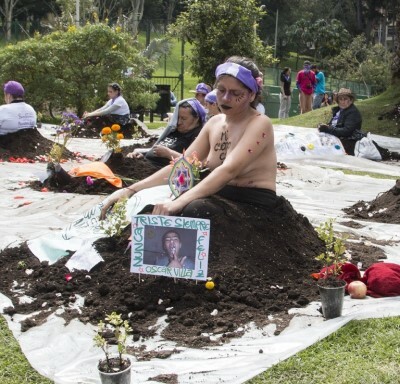 After several debates, the law was approved on July 6, 2015, establishing femicide as a type of crime, thereby making visible this significant problem in Colombia. This problem is compounded by the fear of reporting and high levels of impunity: “according to a study by the Public Prosecutor’s Office that year, impunity in cases of violence against women has reached up to 96%. According to experts, in cases of gender-based violence, the Colombian justice system tends to blame women or not believe them and to excuse their aggressors." “I am planting myself for the women who could not be, who could not have." These are just some of the stories among so many other painful stories, coming together with a shared purpose: to plant themselves, connect with the earth, reconcile with their bodies and heal, to collectively flourish and continue defending life. The Cuerpos Gramaticales collective is open to those who want to dignify memory, territory, and body, and was founded in the Comuna 13 district of Medellín as a way of uniting art and catharsis to heal the pain left by 23 military operations, including Operation Orión and Operation Mariscal, the most well-known for their massive military deployment and serious human rights violations. 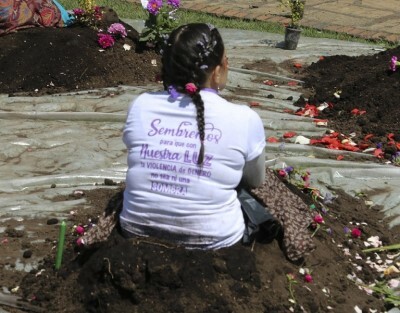 Before, during, and after these operations, it is estimated that 300 people were forcibly disappeared and allegedly found buried in the largest mass grave in a rubbish dump known as La Escombrera. Several regional human rights organizations and victims’ organizations are part of the collective and at the beginning of this year, taking stock of what had happened the previous year, they decided they wanted to tell the stories told by the bodies of the women members of the collective, and also the stories of murders of social leaders: “since the beginning of the year, we began to talk in the collective about the importance of recognizing the violence that is recorded in women’s bodies, and so we began by investigating the issue of femicide in Colombia, to recognize the history of the survivors of these attacks against their bodies, but what was really important and led to a union of more than 30 organizations, was to recognize from our individual bodies, how this gender violence had affected us as well and to identify this as a collective body, to reflect and find a process of catharsis,” explains Sandra Álvarez, one of the founders of this process. On the other hand, the objective was to make visible the stories of detained women and how their bodies continued to talk after they were disappeared, as in the case of Nydia Erika Bautista who was raped and tortured during her disappearance. Another aspect of this action with our bodies was to honor the women who fought, got up and took care of their lives in the middle of the armed conflict, they looked for their sons and daughters, “highlighting the dignified work that these women have done, these defenders of their territory,” Sandra highlights. The morning of Sunday, November 25 was full of symbols of protest. It was a union of women, but also men who reject this violence. 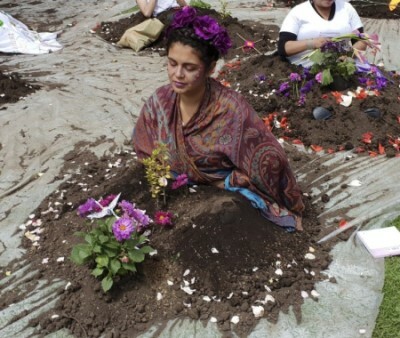 At the end of the performance-action, the 40 women who were planted joined together with the other people present who were supporting the initiative, and their cry was “we unite and mobilize to guarantee a society free from violence, we are Cuerpos Gramaticales,” then they read a manifesto promoting the empowerment of women and a rejection of violence against them and their bodies, for being women. A moment of strength and hope, full of smiles.